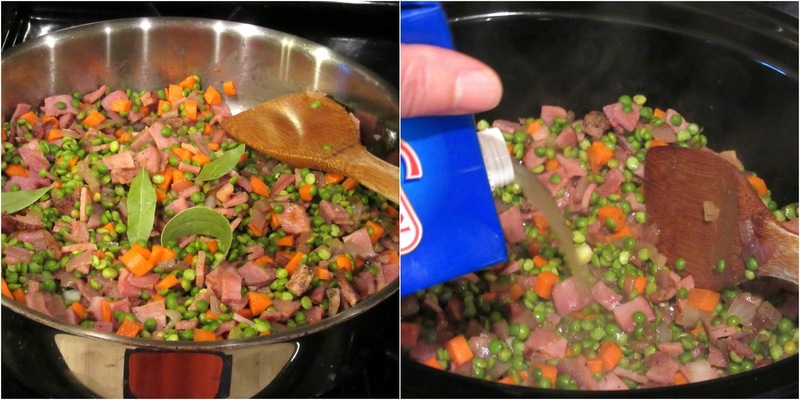 My husband’s least favorite vegetable are peas, so it was my quest to make a split pea soup that even he would enjoy. Personal challenge accepted. Game on! 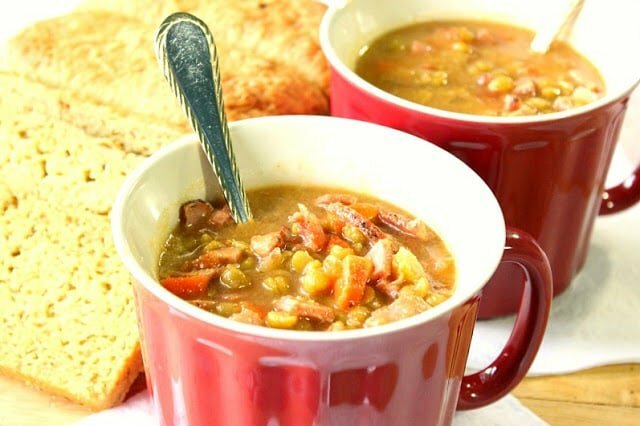 I’m pleased to announce that even though my husband wasn’t very thrilled when I told him that we were having split pea soup for dinner the day I had made this, while he was eating this Slow-Cooker Split Pea Soup with Ham, he told me how much he liked it and he gave it a full two-thumbs up! Score! Since this recipe doesn’t call for a ham bone to flavor the soup, the best way I know to get the most flavor out of the ham is to brown it well in a skillet before adding it to the cooker. Another way I added unexpected flavor to the pot is by stirring in some prepared salsa. Doing this gave the soup a lovely color and took away some of the “greenness” that I thought would be a turn-off for other pea-haters out there, like my husband. -In a large skillet, brown the cut ham in 2 tablespoons butter. Stir in the onion and carrots and cook, stirring occasionally, for approximately 5 minutes. -Stir in the dried peas, salt, pepper, coriander, bay leaves, and about 1/4 cup of the chicken broth, making sure to scrape up the browned bits at the bottom of the skillet. 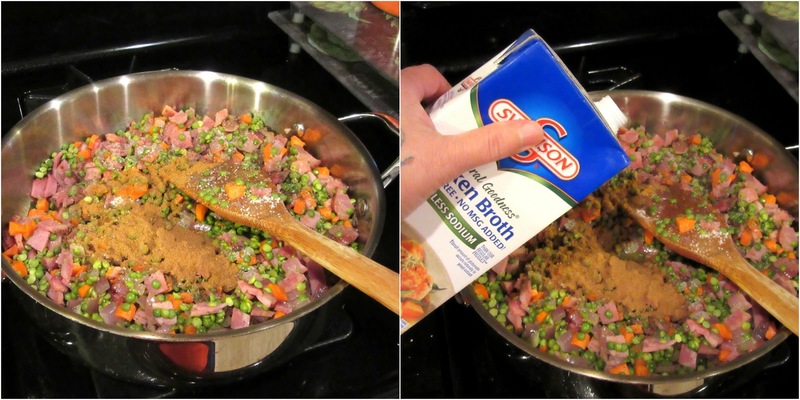 -Carefully transfer the mixture into a 3-4 quart slow-cooker. Pour in the remaining chicken broth and stir in the prepared salsa. 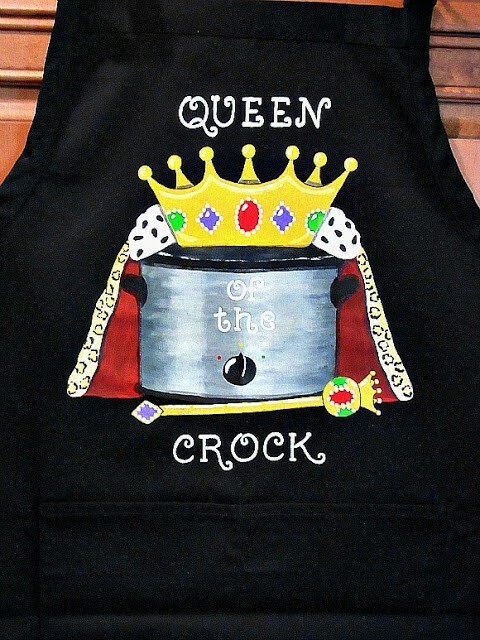 Cover and set the cooker for the preferred cooking time (6 hours on low – 8 hours on high). -Right before serving stir in the lemon juice and 2 tablespoons butter. Serve by ladling the soup into bowls, and serve along with some hot bread and a green salad. You’ll notice that the peas in this soup are not all mushy and soft, even after cooking for hours and hours in the cooker. I think that’s what my husband appreciated most about the peas in this soup. They still had a soft little bite to them, so his whole “pea texture” thing was no longer an issue. Yay!
. LOL Just kidding. I always put my clothes on! If there is ever anything I can paint for you, from aprons to tea towels, to glassware, please don’t hesitate to contact me or visit my shop on Etsy. Custom orders are always welcome, and always encouraged. I’ll also happily work from any photo or description you send my way. Kudos Kitchen by Reneé ~ Where food, art and fun collide on a regular basis! 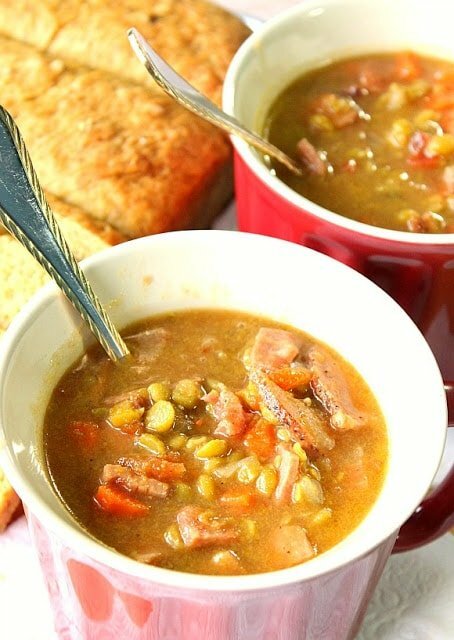 Split pea and ham soup has always been a favorite – such a great comfort soup! This slow cooker version looks so flavorful and delicious! Any soup or dish made in the slow cooker is right up my alley this time of year. This looks like the perfect comfort food. 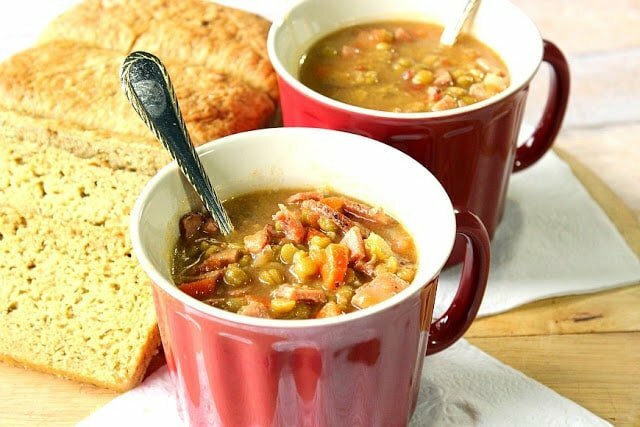 Soup with ham is one of my fall faves!! I love all the ham in there. Delicious! It's been so long since I made split pea soup. This recipe looks so good, I've got to make it again soon! 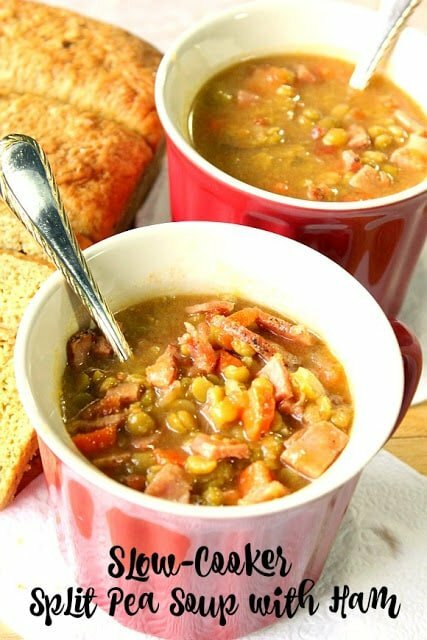 My husband isn't a fan of split pea soup, so now I really want to make this to see if I can sway him. It looks so comforting and hearty, Renee! 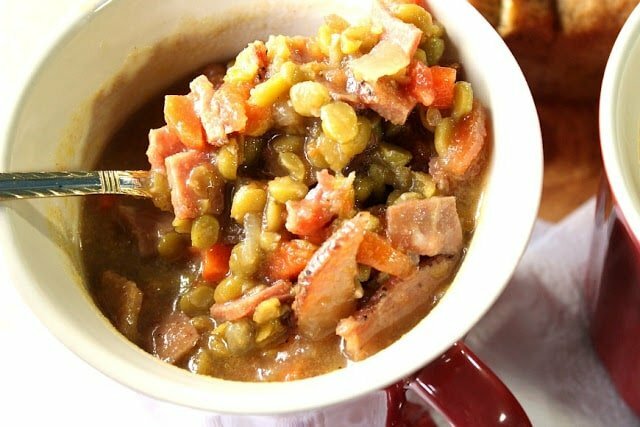 I absolutely love split pea soup, but haven't had any since at least last year. I wish I could reach in and grab a bowl for myself, it looks incredible! I haven't had split pea soon in who knows how long. This looks utterly delicious. Split pea soup is my husbands favorite! We can easily eat a whole pot of it for dinner. Love that this version is done in the slow cooker. Whatttt how can he hate peas. haha Peas are like totally one of my favorites! YAY for making the soup and for him liking it! Win! I love this recipe, it's has such a great depth to it. I love all the amazing yummy flavour you added. This is split pea soup for a new era. This reminds me of my day…his fav! It is always a great day in the kitchen when we can make those small victories! The soup looks amazing! Slow cooker heaven! Such a fan of split pea soup. Yum!